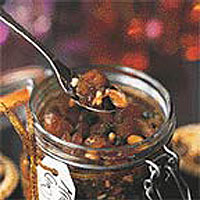 This mincemeat can be made up to 2 months ahead, but it will already taste delicious after just 1 month. Preparation time: 30 minutes, plus at least 2 hours standing time. Using kitchen scissors, cut the apricots into small pieces and place in a large mixing bowl with the chopped almonds, or use a food processor, chopping the apricots and almonds separately. Do not blend too finely. Stir in all the remaining ingredients, mix well, cover and leave to stand, stirring occasionally, for at least 2 hours or overnight. Spoon into sterilised jars (see 'Cook's tip'), pressing down well with the back of the spoon to ensure there are no air gaps. Cover with wax paper discs, seal with lid and store in a cool, dark place until ready to use. To sterilise the jars, either wash them in warm soapy water and rinse well, or put them in the dishwasher on a hot cycle. Then preheat the oven to 160°C, gas mark 3, place the jars upright on a baking tray and heat for 10 minutes. Allow the jars to cool before filling with mincemeat. This recipe was first published in Fri Nov 01 00:00:00 GMT 2002.